Marshall Milton Keynes Athletic Club’s Lara Bromilow continued her excellent form at the London Cross-Country Championships with another podium finish. After winning the competition in 2013 and 2014, she followed up her 2015 third place finish with a fine second place last weekend. Scotland hosted the annual British Masters Cross-International and John Skelton continued his excellent form from Australia at international level by leading home the England M65 team to victory at Glasgow. Individually John placed third with his England team-mates 4th and 5th. J.J Murphy representing Ireland was first past the post. Four cross-country enthusiasts contested the annual “Herbert’s Hole” 10km race at Chesham. Jim Miller placed 126th with a time of 56.28, Alison Ray 159th(50.10), Vanessa Stride 208th(65.06) and Karen Bugaj 235th(67.40). The Dirt Half-Marathon, an off-road event embracing the Grand union Canal and Stockgrove Park saw the Wood brothers lead home eight MMKAC runners from the 700-strong field. Ian Wood placed 13th(87.45) and Ross Wood 16th(90.32). Casper Zoeftig finished 19th(92.40), Neil Jones 55th(97.54), Robby Taylor 95th(101.380, Fran Malin 99th(102.09), Alasdair Gibson 117th(103.54) and Maria Calleia 160th(108.27). 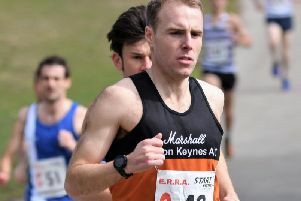 On the roads Chris Cahill finished 193rd from the field of some 1100 at the St Neots Half-Marathon(95.41) whilst Steve Martin was close on his heels, 204th in 96.26.